Contract Details: 1 Year initial contract. 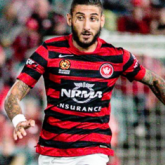 Highlight: Score on his debut for the Wanderers against Melbourne City in Round 15 season 2014/15. Highlight: Scored on his debut for the Wanderers in the Asian Champions League against Kashima Antlers. Description: A cultured attacking midfielder who plied his trade in the J-League, spending a decade at Sanfrecce Hiroshima. His short time at the Wanderers saw him deployed as a defensive midfield playmaker in an effort to help retain possession. Somebody make gif of sumo goal celebration. Very impressive today and worked hard off the ball and is exactly what we need. #SabaWho? Loving this guy at #8 - it's giving us a much more fluid transition, like when Aaron was still here. He's still a bit lost positionally in defence (ball-watching on our first goal conceded midweek), but I've no doubt he'll get there. We will be relishing his class over the next 12 months, already starting to see glimpses of it. Farking Bridgey's injury means we're unlikely to see Yojiro at #8 for a while. I was genuinely excited to see the two of them play together over the coming weeks. I know that was tongue-in-cheek, but 13 posts in and I'm still waiting to see something resembling a positive comment. Do you even Wanderers? Hehe I'm really enjoying Yusuke, who hasn't made the schoolboy errors of our other full-backs. Can't wait for his fitness and Yojiro's to improve - they both have talent and end product. What I meant by the above comment was entirely positive - I think he's a stellar #10 and more of an Ono-replacement than Saba ever was, and I think he's wasted in DM, even if he can obviously do a shift there. I'm a cynic, admittedly. Do you even Football? Too positive mate do you even internet john? Where's the whinging and finger pointing? Wholly positive comment: "It's great that the RBB are learning that songs have more than one note and trying to SING stuff more". Unfortunately being generally positive about our performances all season and whinging only about individual error and 'shoot/cross/pass ....en' has still lead to a lot of vitriol from me - especially at Shannon Cole who I've suggested needs to work on either his football or his penmanship, and Adeleke, who looked good going forwards, but needed a shaded area drawn on the pitch. Given that the last time I ragged on Cole for buggering up the offside trap, Popa did too, I'm kinda happy. 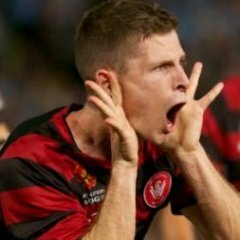 "Meanwhile Western Sydneyâ€™s Japanese midfielder YÅjiro Takahagi has according to Japanese sources rejected an initial contract extension from Wanderers. The playmaker who signed from Japanâ€™s Sanfrecce Hiroshima in January is understood to be fielding an offer from Newcastle Jets where Reds defender Nigel Boogaard has signed for the new season." I am not excited about this at all. **** off Newcastle. You flops. It's our own fault, sign him up as marque or lose him to a bigger offer from another club. Pay him what he is worth or he is gone as he is quality. I bet our original offer was off the mark and may insult him forcing him to look elsewhere. Sickening feeling even contemplating him leaving. Stability is what we need. Not sure why all the love for this guy. Tries to play the one touch pass way too often and lose possession too much. Sure he's got some nice touches but nice touches don't mean **** if you can't turn that into an impact on the game, and he doesn't have enough impact in my eyes. Why is it that in a team that now seems intent on knocking the ball around a lot more than previously, whenever it comes back to the top of the D from the wing, right when we need a good shooter on the ball, it's always La Rocca or Poljak? Where is this guy?? And too often the ball comes pinging out from a clearance from a cross (at both ends) and Takahagi seems to realise that he should be there, so he runs to get to it, but it is too late. Some good touches, the rest is very meh. Can see the benefit in keeping him for continuity (we need some badly), but the good teams in this competition have foreign players who make a difference. He doesn't make enough of a difference. Sorry, but we need more players who are able to do one touch passes and keep the ball moving. Most of our team needs two or three touches before they figure out what to do. That's why this guy is a class above. A lot of our current players have feet made of concrete. A lot of the problem this season is that instead of letting the ball do the running, our players are doing all the the running. Not a very smart team. No wonder we tire and other teams end up running over the top of us. Yojiro might not be a number 10, but he is definitely a good distributor from behind.he is also one of the few players that can hit a free kick in this league. I hope he stays and we pay him accordingly. He won't be the star player but he will fit into the team well. He's alright...definitely not a marquee player though. If he wants those kind of wages then I would sell him without thinking about it. We probably said the same thing about Mooy and look how that turned out. If you asked me for example what we should do with marquee spot?